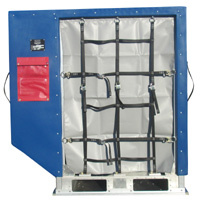 DPE or DPN Air Cargo Container options. Offering reduced maintenance & tare weights. AKE or AKN Air Cargo Containers, available in colors for easy identification. DQF or DQN variants available offering single piece polymer shells for reduced maintenance. October 22, 2013 -- A well-recognized UPS executive and specialist in the air cargo industry has partnered with Granger Aerospace to further expand its manufacturing and distribution operation. Richard O’Marra is a name familiar to many veterans of this industry as he has a history of diverse experience dating back to 1970 led to thirty years tenure at UPS, including the the last fourteen years as the ULD Control Manager for the company. Granger Aerospace Products has retained Richard O’Marra to join forces in the continuing expansion of its ULD manufacturing and leasing offerings. Richard began his career in the Air Force moving directly into a position with the FAA as an Air Traffic controller in NY in 1977. In 1983 he began his career with UPS as a Preload Operations Manager streamlining volume flows from sorting to ground and air networks. After over a decade of service in this area UPS moved him to their Louisville hub in a reassessment role assuring the company was operating its ramp and air operations as effectively as possible. From there he finished his career with UPS as the ULD Control Manager, an essential position overseeing logistics, cost and balance of all air containers worldwide for UPS. He retired in 2013 from the company after a prestigious career. During his time at UPS he was regarded as an authority on ULD’s and served in numerous positions with the International Air Transport Association (IATA). After being elected to the executive Committee in 1999 he became Chairman of the IATA ULD User Group in 2004 then the ULD Technical Panel in 2005. He was re-elected and continued to serve in both positions through the terms ending in 2012. In these positions he was responsible for development of ULD specifications, guidelines and technical material for the manufacture, registration and standards for ULD and cargo restraint systems for the industry. He also served as President of the ULD CARE group, until his retirement from UPS in 2013. After many years of producing elements of custom ULD containers, Granger Plastics Company officially expanded into the Aerospace Industry in 2012. Expansion included launching Granger Aerospace Products as a division of Granger Industries, which required outfitting Granger’s manufacturing facility for production of aerospace products. The continuation of this development occurred as Granger Aerospace Products received its first TSO authorization from the FAA readying a revolutionary line of ULD containers for market. Several employees have been hired to staff and fulfill the requirements of Granger’s aerospace expansion. Richard O’Marra is a valuable addition of knowledge and experience to this growing operation. The Granger Aerospace Products ULD has a one-piece body that is rotationally molded from polyethylene. The unique polyethylene construction offers a longer lifespan and significantly lower maintenance costs reducing the overall cost of ownership of the containers. It is less likely the containers will need repair due to the way the polyethylene behaves under stress. Polyethylene also allows for on site repair of damage which dramatically reduces lost time for repairs. The Granger ULD container offers a multi level solution to common issues with other materials regarding durability and lifespan. Available air cargo containers include LD 2, LD 3 and LD 8 all available in standard and fork-liftable versions. Granger Plastics, a division of Granger Industries, continues to be internationally recognized as a leader in the field of Rotational Molding. Granger Plastics is known for innovative design, superior quality and industry leading solutions for a number of industries ranging from poly tanks for chemical and agricultural use, family safety, defense, aerospace, material handling and more. For more information on Granger Industries or Granger Plastics Company, please visit contact 513-424-1955. LD 2 ULD Containers by Granger Aerospace. LD 3 ULD Containers by Granger Aerospace. LD 8 ULD Containers by Granger Aerospace.